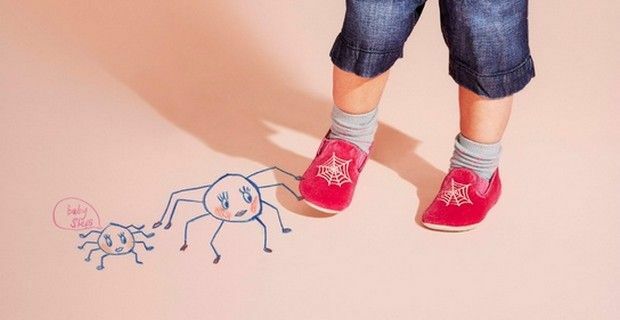 Luxury shoe label Charlotte Olympia has launched a capsule shoe collection for little girls. The collection includessix different designs: Bisoux, Charlotte’s Web, Kitty Flats, Pamela, Tutti Frutti, that are all slip on flats, while the Beatrix silhouette is a lace-up leopard printed bootie, and many of the shoes are just mini versions of the adult designs (the Kitty flats, Web Embroidered slippers, and Bisoux flats). Each model is made in Italy, and depending on the style, features either ponyskin, velvet , satin (in several bright and vibrant colors) or multi-color suede and leather, and decorated with different elements that forms kitten faces, spiders webs, a rainbow of fruit inspiration and also a cut out lip style. Each pair of shoes also come with a coloring book and crayons and like the adult shoes, an adhesive Polaroid picture which can be placed on the outside of the shoe box. Prices range from £195 to £ 245 and ten percent of Incy's first month of sales will go to The Art Room, a UK charity, offering art as therapy to children and young people to raise their self-esteem, confidence and independence. Charlotte Dellal decided to launch the mini me shoes because she is expecting her third child. "I always thought I'd design little shoes for little people as soon as I had a girl," Dellal told Vogue UK. "However with two boys now and a third child on the way, I decided to finally launch Incy regardless. Maybe I'll have a girl this time!"